In 2008 I moved from my modern farm in northern Ohio to a much more relaxed rural setting in western Pennsylvania. We have been visited by wildlife of all sorts including a black bear. Our home is near the Allegheny river where we take nice relaxing walks with the 'poo crew'! The beauty and challenges of winter in PA! Life on a working farm is neither dull or relaxing! There is always work to be done and animals to tend to. We pride ourselves on the care that each and every animal on our farm receives. It's a hard working life but one we truly love. Whats a farm without chickens! World's most handsome rooster makes his home at O'Kaylyn Farms! and all grown up...still winning Grand Champion Jersey! When your new puppy leaves us and joins you in your home, we like to make the transition as smooth as possible for him. He is sent home with his little puppy suitcase that contains some new toys and chewy items to get you started. One of the toys has the scent of his mother and myself; this way he feels safe no matter how far from our home he is! You will also receive a folder full of information about your puppy: his registration papers, his micro-chip information, shot records, vet records, his pedigree, your written health guarantee and some general handouts I've picked up from other sources as well as ten pages of puppy info and instructions. I also send home a small bag of the food he has been eating. Charlie, seen here in the photo, has settled into his new home very nicely. He's even taken the ferry across Lake Erie to the islands already and in winter he flies over in a small plane. Many potential puppy parents ask me about shipping their puppy to them, we no longer ship puppies, however we are happy to help you if you would like to fly in and take your puppy home in cabin with you. O'Kaylyn Farm puppies have found loving homes in Florida, Texas, Minnesota, Wisconsin, Michigan, N. Carolina, Ohio, Pennsylvania, New York, Connecticut, Virginia, West Virginia, Kentucky and Tennessee so far. Grooming is not really as scary as it sounds. Owning a poodle means you will never have the shedding problems associated with other breeds, like hair all over your nice suit or furniture. 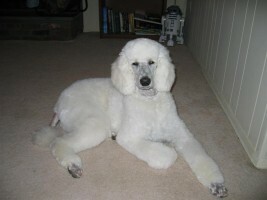 BUT you will have to have your dog groomed on a regular basis. I start my puppies with nail trims at 2 weeks old. From there we move on to putting the poms on their little tails to get them used to the sound of the clipper. Soon after, they get their first bath and blow-dry at around 5 weeks old. By the time they are 8-9 weeks they are standing on the grooming table like a pro. But as a poodle owner you must do your part and brush your poodle on a regular basis--every day at first, to get him used to the routine. 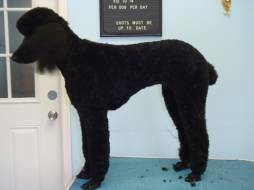 After he matures, you can go to 3 times a week brushing, with professional grooming sessions about every 5-7 weeks. If you keep up with the brushing you can finish in 5-10 minutes! You can have as much work with at home grooming sessions or as little as you desire, depending on the clip you like the best. If you love the time spent brushing your dog, then a full coat trim is great. If you work a lot and don't have much time to spend on home grooming, then go for a shorter style. No matter what style you choose, just be sure to keep up on regular grooming sessions for your dog. A matted dog is a neglected dog!! Please be aware that grooming is a part of this breed's life, and consider this before making a commitment. Lex has a beautiful coat. 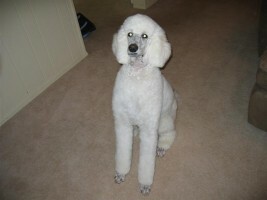 Your poodle can, too, with the proper care. Lexie now lives in New York. She is from Chauntae & Trevor's Feb. 14, 2005 litter, and is Lacey and Charlie's littermate. "I just wanted to express our delight with your puppy. Your breeding is the greatest. It was worth the wait of over a year for Leland. 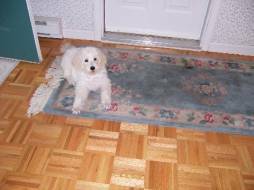 Thank you again for our great puppy." © 2019 O'Kaylyn Farms Standard Poodles. All Rights Reserved.